Howard Moore, New Zealand Tree Grower November 2011. A one-day forestry seminar was held in Wellington on 30 September to exchange ideas with a delegation of French forest owners, forest managers and scientists, along with the Spanish President of the European Union of Forest Owners, Inazio Martinez de Arano. Introduced by the French Ambassador, Francis Etienne, the purpose of the seminar was to share information which might lead to better results in commercial forestry for small forest growers. Without the benefits of collective representation they can be poorly informed, poorly organised and sometimes poorly served. Inazio Martinez de Arano, the keynote speaker, outlined the issues faced by forest owners in south west Europe. The forests, like their owners, are very diverse and fragmented. Profitability is low and the public is increasingly demanding that forests be managed for environmental values, but they will not pay for them. European climate change initiatives are undermining forestry, which is not supported as an offset. Authorities cannot decide a balance for providing infrastructure, controls and innovation. Forest owners have a weak position in the value chain and a business model that is becoming impossible. His short message to small forest growers was to unfragment forestry and jump into the value chain. Yves Lesgourges, Director CRPF Aquitaine and Christian Pinaudeau, President of the Association of Forest Owners of the Southwest of France, outlined their experience with the forest of Aquitaine on the Atlantic coast of south west France. The forest covers 1.7 million hectares, mostly in pines. Much of it was lost to fire in the 1940s, but after replanting and with modern management and genetic improvement its productivity has tripled, and it now makes a large contribution to the regional economy. Unfortunately in 1999 and 2009 it suffered from catastrophic wind storms which halved the forest mass, created a replanting backlog of 200,000 hectares and slashed production. Wood demand is now more than the forest can supply, while the frequency of storms and the threat of insect and fungal attacks is rising. Around 80 per cent of the forest area is privately owned. Every owner with more than 25 hectares has a management plan and owners cooperate in regional groups supported by a central union. This lobbies government, provides insurance, trains forest owners, arranges forest certification, aids research transfer, negotiates log sales and provides an industry bank taking deposits and making loans to members. The main message for forest growers from the two men was get together to meet the challenges and produce the benefits. Chris Goulding, Principal Scientist at Scion, outlined the large, vertically integrated forestry cooperatives and associations in Sweden and Finland. Sodra in Sweden was formed in 1938, has 10 sawmills and three pulp mills, and its 51,000 members own half of all privately owned forests in southern Sweden. Sodra provides an international market, gets involved in forest policy debate and helps its forest owners stay profitable. In Finland growers join regional Forest Management Associations which offer services including valuations, timber sales plans, management plans and tax returns, as well as tenders for site preparation, planting, thinning and harvesting. The cooperative Metsaliito, which started with log sales in 1934, has become a large multinational wood-processing company owned by 131,000 foresters with over $10 billion in annual sales. Chris’s message was − we should make a start. Jean-Michael Carnus, Director INRA Forest Research Centre Bordeaux, Aquitaine and Tim Payn, Principal Scientist at Scion enlarged on the international cooperation between France and New Zealand on forest research, linking Scion with INRA − the forest research centre in Bordeaux. Climate change has a major effect on forestry from species distribution, biotic risks, fire and storms. The TRANZFOR programme is helping scientists to build networks and share information and resources to address issues including genomics and tree breeding, forest models, environmental services, risk assessment and bio-energy. The results are helping both countries develop adaptation strategies. The message was − sharing research is both successful and valuable. 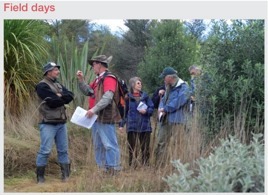 Jenny Aitken, Managing Director at The Tree Lab, Rotorua and Alain Rival, CIRAD Systèmes Biologiques, Montpellier, described using the Dumont d’Urville programme. This helps fund research into the identification and traceability of plant lineage using DNA analysis of tissue samples. They included techniques for overcoming the problems of securely shipping tissue culture material between countries for further research. Their work has direct commercial applications in identifying useful variants for adapting to climate change, and was a good example of the benefits to applied science of international collaboration. Hon Peter Dunne, Minister for Revenue, acknowledged the importance of forestry in the New Zealand economy across a range of sectors including ecology, climate change, tourism and forest produce. With regard to collaboration, he noted concerns about the effect of tax on the aggregation of smaller forests, observed that the forest industry as a whole was largely indifferent to it, and confirmed that the government had no plans to change the law. However, he did suggest that if growers could find an initiative that solved the problem while posing no real threat to the tax base, Inland Revenue officials would be open to discuss it. His message was − we cautiously support new ideas. Geoff Thompson of Keily Thompson Caisley outlined the forestry recommendations in the report of the review of the ETS. The government is committed to the ETS, which will remain in place despite post-Kyoto uncertainty. The government strongly wanted more forests planted and might introduce offset planting for pre-1990 forests to improve land use efficiency. It was investigating ways to mitigate the harvest liability for post-1989 forest growers, to help them join the ETS and sell the credits from their immature forests. The recommendations of the review panel would go to Cabinet for approval in the NewYear. In their opinion the government’s message was − we are doing our fair share. Iain Cossar, Director Sector Development, MAF, confirmed the government’s role in forestry through MAF. MAF had an emphasis on trade and access to markets, worked as a partner with primary industry stakeholders and supported industry via various initiatives including the Primary Growth Partnership. Although the Ministry was being restructured it would remain the main department for the primary sector, which accounted for over 70 per cent of the country’s processed export earnings. He agreed that there was benefit in the better coordination of small forests but leadership had to come from the industry. David Rhodes, CEO NZ Forest Owners Association, described the role and structure of the FOA and Woodco. Members of the FOA own or manage more than 80 per cent of the country’s 1.8 million hectares of plantation forests. Woodco represents the collective industry including processors, and develops strategies for research within the industry, for marketing the forest and wood sector, and for the better understanding and use of wood in the market place. His message was that the necessary useful national structures exist. 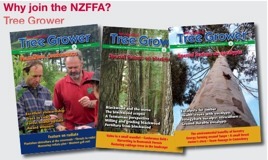 Hamish Levack, from the NZFFA Executive, outlined the planting boom which followed the price spike of 1993, pointing out that it may lead to a supply crisis if all the owners of these small forests attempted to cut their trees at the same age. The supply bulge could be avoided and converted into a controlled, sustainable yield if the industry started planting more trees now, and the owners cooperated by spreading some harvests forward and others back. Reports from 1993 showed that most forest owners at the time could not take advantage of the high prices because of harvesting bottlenecks. If the owners did not adopt a voluntary controlled cut in the future, they would forgo substantial potential profit. His message was − we will all be better off if we can consolidate these small forests. Don Wallace, Chairman of the Wellington NZFFA Branch, explained the problem of identifying the many small forest owners whose plantings after 1993 will cause the supply bulge. Although the local authorities knew most of the growers’ names and addresses, they would not tell anyone because of the Privacy Act. Instead the NZFFA had to invite forest owners to register when they gathered at public meetings convened by council staff to discuss forestry issues such as fire control, resource consents and road improvements. A pilot was run with the Kapiti Coast District Council which showed that this method could be used successfully to identify many of the growers in the region. Using this method Don confirmed that we are starting to identify and contact small forest growers. Howard Moore, business consultant, outlined a mechanism that may allow growers to consolidate their small forests without creating a tax imbalance from the sale of standing timber. A forest grower could forward-sell the future harvest revenue instead of the trees. As owner of the harvest revenue, the buyer would hold the forest and marketing risk. The seller would retain, manage and harvest the forest, paying the harvest revenue to the buyer when it was realised at the pre-determined harvest date. The mechanism should allow groups to consolidate small forests and harvest them according to a mutually agreed and planned schedule without incurring tax penalties. He believed tax may not be an impediment to consolidation. Small forests have been aggregated into economically successful cooperatives overseas. We can learn from their experiences. If New Zealand forest owners are willing, there are no real impediments to creating the same business models here.